Lock in a great price for Hotel Saratoga – rated 8.5 by recent guests! The staff was very friendly and the rooms were perfect for a couple. Location was pretty good - not a far walk to most attractions - and a beautiful ~25 minute walk to the beach. 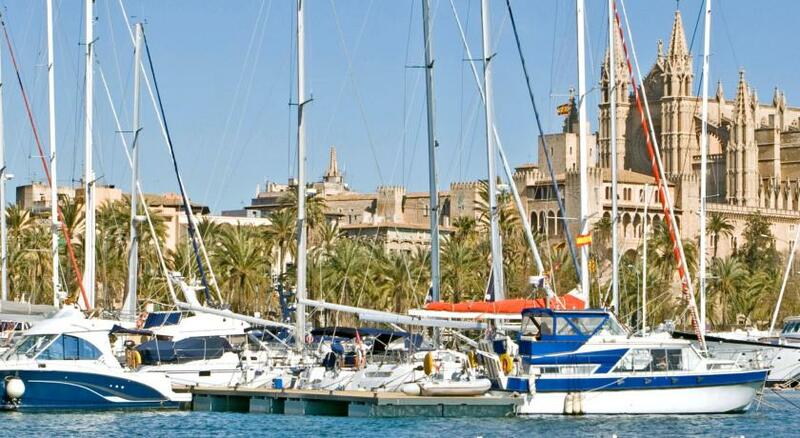 Great place to stay for a few days if in Mallorca! THE LOCATION WAS THE BEST FEATURE FOR THIS HOTEL!!!!!! 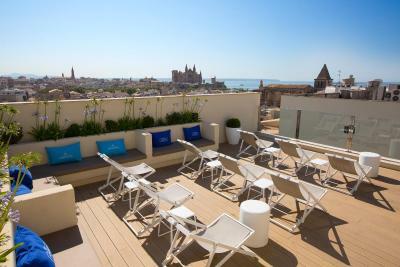 Great location and the views from the roof top terrace were stunning. Many different tasty choices at the breakfast bar. At the reception I'd mention Nico that I had my birthday the day after and for my surprise it was delivered in my room some fruits, chocolates and a small bottle of Champagna! Since I was traveling alone, my room was on the small side but it was clean and had a nice balcony. The two pools were great for the hot days and having the jazz club on the top floor was great. I’d stay here again, as it was so close to many things. Wonderful hotel! Neat, clean and modern. I chose a sea view room and the view of the marina and street was lovely. The rooftop pool and bar is a bonus at this hotel. Buffet breakfast is worth the money. Nice location, Staff were cool, I feel quite expensive for what you get! Hotel Saratoga This rating is a reflection of how the property compares to the industry standard when it comes to price, facilities and services available. It's based on a self-evaluation by the property. Use this rating to help choose your stay! 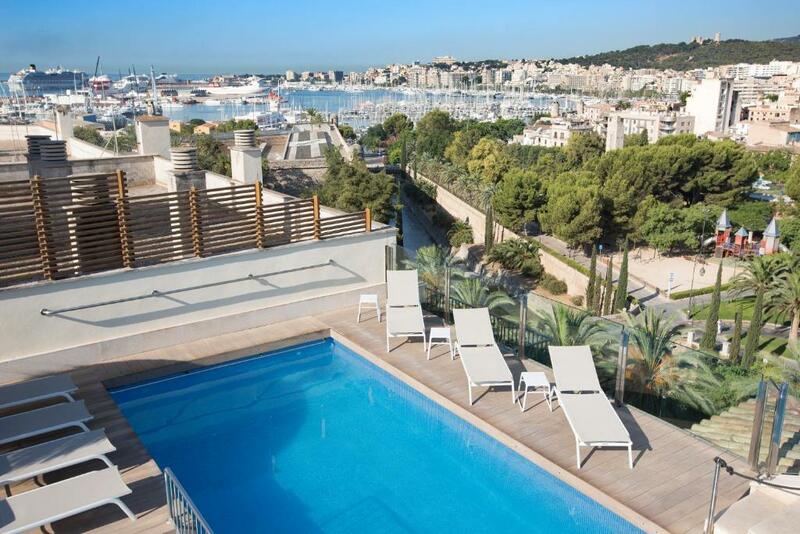 One of our top picks in Palma de Mallorca.Located in the center of Palma de Mallorca, the luxurious Saratoga hotel has a rooftop pool with beautiful city views. It features a jazz club and free Wi-Fi throughout. 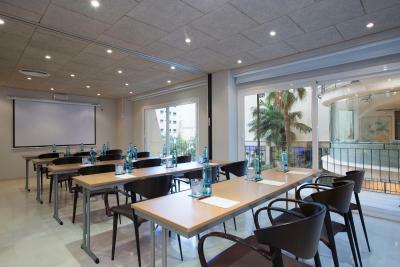 The hotel is located 5 minutes’ walk from the Contemporary Art Museum, the port and Palma Cathedral. 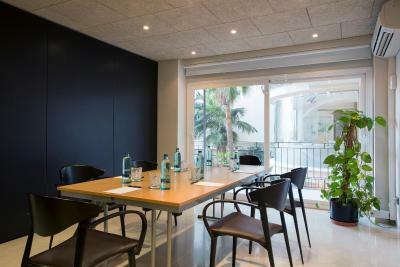 It is also just 200 feet from the exclusive Jaime III shopping avenue. The spacious and elegant rooms at the Saratoga have a flat-screen TV with satellite channels and air conditioning in summer and heating in winter. Some rooms have a private balcony. The Saratoga has a second pool in the gardens with a poolside bar. 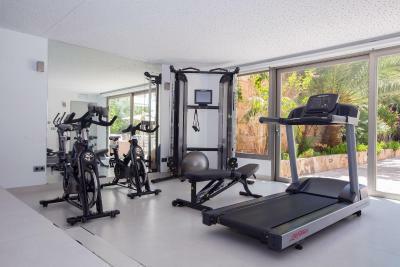 The hotel is ideal for cyclists, there is a modern fitness center and a sauna, and massages are available for an extra cost. The Jazz Club offers spectacular views and a wide range of dishes. This room features flat-screen satellite TV, a free safe and free Wi-Fi. There is also a mini-bar and a phone with automatic answering machine and wake-up calls. The private bathroom includes a hairdryer. Some rooms have a balcony. Extra beds cannot be added to this room type. Air conditioning is available in the summer and heating in the winter. Private parking is available on site (reservation is needed) and costs EUR 16.50 per day. These suites feature a balcony and a lounge. There are 2 TVs with satellite channels, a music system, free safe, free Wi-Fi, a mini-bar, and a phone with an automatic answering machine and wake-up calls. The bathroom includes a hairdryer and Rituals amenities. 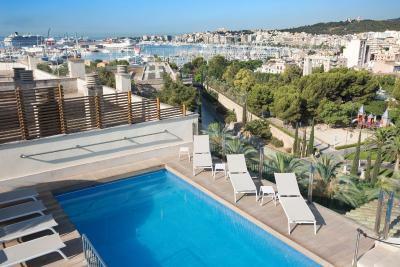 Some suites offer views of Palma Bay (for a supplement). These rooms feature flat-screen satellite TV, a free safe and free WiFi. There is also a mini-bar and a phone with automatic answering machine and wake-up calls. The private bathroom includes a hairdryer. Air conditioning is available in the summer and heating is available in the winter. This spacious suite features a seating area with flat-screen satellite TV, a free safe, a mini-bar and free Wi-Fi. There is a phone with an automatic answering machine and wake-up calls and a bathroom with a hairdryer. Suites with a balcony are subjected to availability. 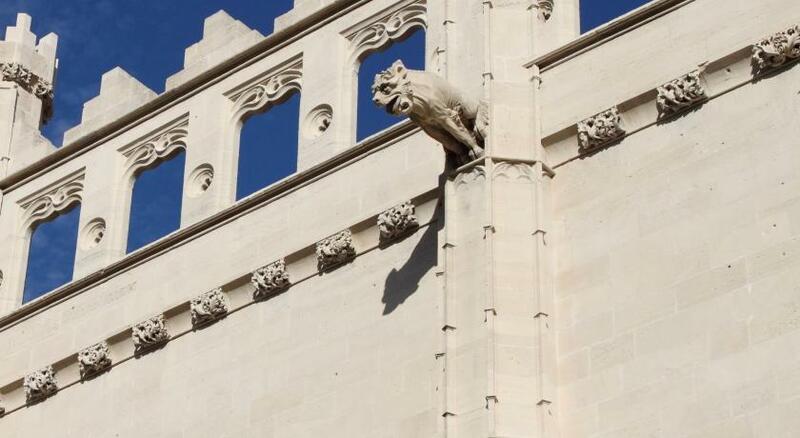 Rooms with disabled access are available upon request. This comfortable room includes 1 king-size bed or 2 single beds. It features a flat-screen satellite TV, a free safe and free Wi-Fi. It has a bathroom with free toiletries and a hairdryer, as well as air conditioning in summer and heating in winter. This room features flat-screen satellite TV, a free safe and free Wi-Fi. There is also a mini-bar and a phone with automatic answering machine and wake-up calls. The private bathroom includes a hairdryer. Some rooms have a balcony. This suite features air conditioning in the summer and heating in the winter. It comes with a mini-bar and a seating area. Rooms with a balcony are subjected to availability. This room features sea views and has air conditioning is available in the summer and heating in the winter. Hotel Saratoga accepts these cards and reserves the right to temporarily hold an amount prior to arrival. Please note that the guest name on the reservation must be the same as the owner of the credit card used to make the reservation. This card must be presented at check-in. Name change or change of credit card is not permitted. Please note credit card cannot expire prior to check-out date. Please note that a shuttle service is available on prior request at an extra cost, for group of 10 people or more. Please note that for bookings with free cancelation, the guest will be charged the total price of the reservation on arrival. Its meant to be one of the nicest hotels in Palma, but I found it very standard and I found cockroaches on the floor in the afternoon when I came back to my room. The insanely loud jazz bar that runs until 1AM on Friday and Saturday. Friday was not too bad, but Saturday was another level. Could not sleep through it, then we had people traipsing past our door after it finished. Like us, you may enjoy jazz, but having it forced on you from 7 floors away when you're paying €160 a night was a surprise. Raised to the staff twice who "made a note for the manager" but they don't seem interested in responding. Very expensive-plus breakfast was offered at €17 extra each. We had to pay tourism tax on top of our booking which was prepaid. Pool very small & overlooked by reception & bedrooms. Location was perfect & the rooms were fab. Very clean. The shower in the room I was given (room 31) showing signs of ageing; it is no longer firmly affixed to the wall. Getting connected to the hotel's wifi is still a bit of a mystery; from a previous stay I recall it was somewhat complicated. I did not pursue it very hard this time, as I could survive without it, but it is something the hotel could definitely make easier. Finally, I could do with breakfast starting 30 minutes earlier. Despite my comments below, the hotel offers a good service across the board, leaving me a satisfied guest. The hotel is quite expensive and does not provide drinking water nor coffee facilities. Not value for Money. Location. Cleanliness. Staff. It’s a new/newly refurbished hotel so it looks nice. Rooftop bar is good. The main thing that I didn't appreciate about my stay was the fact that we were in a non-smoking room, and had a nice balcony overlooking the city and a view of the sea. The problem was, our neighbor spent half the weekend outside on his porch smoking like a chimney, and since we had to keep our balcony sliding door open (no air conditioning in March apparently), our room quickly became smoke filled. Very disappointing. Our room was above the hotels car park, which was very loud throughout the night and morning. The roof top pool wasn't open yet...a seasonal thing, not really their fault. No tea/coffe making facilities in room. The sound proofing was found to be be very poor unfortunately. I could hear the conversations on the lobby and the rooms next door. Not the ideal room if you want peace and quiet. Great location. Convenient. The staff found to be very pleasant and helpful. Even was upgraded to a junior suite. They even went to extent of finding out whether we had a goodnight sleep after neighbors found to be very noisy just past mid night. Pillows weren’t quite supportive enough. Sun beds on the balcony were lovely. Fantastic location. Patient and helpful staff.